Amazon Price: $79.95 $79.95 (as of 2019-04-24 20:04 – Details). Product prices and availability are accurate as of the date/time indicated and are subject to change. Any price and availability information displayed on the Amazon site at the time of purchase will apply to the purchase of this product. The only time you'll ever show your hand is when you're wearing it on your sleeve. Our incredibly detailed playing cards are gold tone with a full color enamel inset. 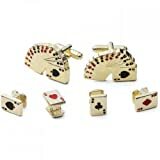 Each set includes two standard cufflinks for a French cuff shirt, and four button studs.